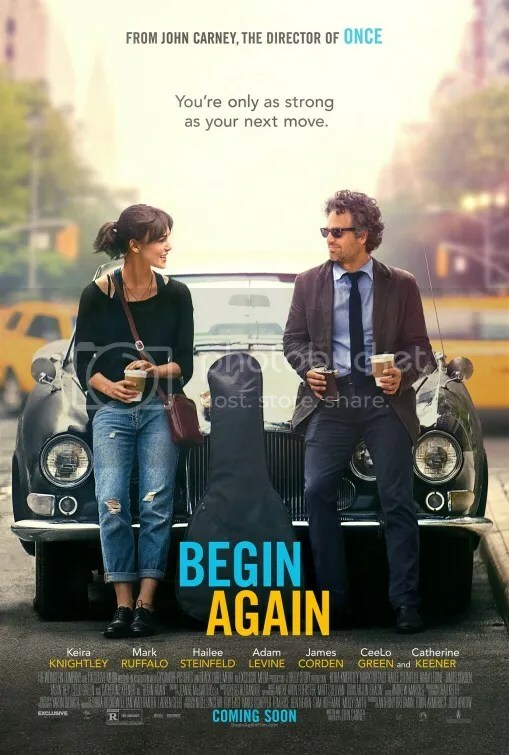 Begin Again is a horrible name for a film. It’s generic and bland and forgettable. Everything that the actual drama is not. Let me be clear. I loved the film. Hated the title. Apparently test audiences didn’t agree. Back in the Fall of last year the picture was called Can a Song Save Your Life? Oh how much better and more interesting that quirky caption would’ve been had it stayed. This is a pure, effervescent slice of happiness that celebrates the beauty of music. The current moniker doesn’t do this inspired tale justice. For the life of me, I always struggle to remember what it’s called. Begin Again is a distinctly New York saga. Keira Knightley is Greta, a young songstress still stinging from the breakup of the relationship with her “no-good ex-boyfriend” Dave Kohl, played by Adam Levine. Mark Ruffalo is Dan a once prosperous A&R executive whose career has hit the skids. Now disillusioned, he hasn’t had a success in years. Then one day their paths cross on open-mike night in some nondescript East Village club. Could the promising folk singer and the struggling A&R rep have the right chemistry to make it big? If this slice of life sounds thematically similar to the musical drama Once, that’s because Director John Carney was also responsible for that surprise indie hit in 2007. It’s been about that long since we’ve had such a sweet ode to musicians who write, compose and perform their own material. Most people will remember Once for the ballad “Falling Slowly” by Glen Hansard and Markéta Irglová. The singing-songwriting stars won the Academy Award for Best Original Song that year. Begin Again is highlighted by a delightful soundtrack as well. The story works because of the authenticity of the performances. But this is a film that relies just as heavily on its soundtrack. Gregg Alexander, best known as the frontman of the New Radicals, co-wrote the music with Nick Lashley, Danielle Brisebois, and Nick Southwood. If there’s anything here that might break out, it would be the quietly soaring “Lost Stars”. Director John Carney does the impossible. He deftly extracts the talent to sing from Keira Knightley with the ability to act from Adam Levine. He minimizes their limitations and highlights their strengths. Knightly isn’t the greatest singer in the world but Carney wisely doesn’t have her push her voice beyond a pleasant lilt. She comes across like someone who idolizes Sara Bareilles. The script namechecks Nora Jones. Adam Levine plays a hungry singer who has recently been signed to a major record label – a moment he once occupied in real life before he achieved mega superstardom. He gets to sing several songs here stripped of the traditionally slick production of a Maroon 5 single. Marc Ruffalo’s appearance as Dan borders on crazy homeless guy. It’s supposed to highlight his downward spiral from success but he’s sheepishly charming by nature so Carney simply allows his personality to assert itself. Begin Again is a beautifully realized valentine to the visionary forces that create music. Director John Carney fashions a collection of snapshots that wonderfully detail the inspiration in producing an album. Dan and Greta first meet in a joyful scene. Dan watches Greta sing “A Step You can’t Take Back” accompanied by nothing more than her strumming guitar. But he imagines the little ditty with a full accompaniment behind her. Each instrument sonically realized before our very eyes as they start playing by themselves in the background one by one: strings, a piano, the drums behind her. Each addition technically only existing in his mind, but we the audience experience what he hears and the results are a window into how an A & R executive might envision the work of an artist. Begin Again is filled will little vignettes that feel like authentic depictions of the music business. It’s a romantic comedy in which you’re never quite sure if the sparks you see happening between Greta and Dan will ever actually erupt in romance. That little guessing game makes the script a bit unconventional. It’s reminiscent of director John Carney’s previous showbiz drama Once. I loved that film so I’m happy to revisit its style. Along the way we’re treated to some beautiful musical numbers as Greta and Dan record an album at various locations throughout New York City. Now excuse me while I go buy the soundtrack. This entry was posted on July 6, 2014 at 6:43 am and is filed under Comedy, Drama, Music with tags 2014. You can follow any responses to this entry through the RSS 2.0 feed. You can leave a response, or trackback from your own site. Cool, I can’t wait to check this out. I’ve gotten a bit behind in my watching schedule and meant to get to this on Friday or yesterday. But the good news is, sounds like I’ve got a great little number to look forward to. I agree Mark, it’s awful title but I guess the alternative does sound like a tagline so perhaps that’s what put people off. I’m glad to hear a positive review, the trailer looks great and I’m glad that Keira Knightley is doing something other than an endless line of period dramas which she does so well. I loved Once too, so I’m looking forward to this even more now. It’s getting great reviews. I’m glad. It’s a wonderful little film. Great review Mark! That original title actually sounds like a title Frank Capra would have used, does it not? I should be ashamed of myself for not having seen Once. I should see that and Begin Again. Spot on! Original title is very much like something Frank Capra would have used, especially It Happened One Night or You Can’t Take It with You. And I’m guessing that’s why you love the title, now isn’t it, Mark. 😉 Let’s not forget It’s a Wonderful Life! Great review, Mark. You’re right about the generic title. This is one of my most anticipated films of the year and I feel that I’ll really enjoy it. The cast is really what sells it. Loved everyone in the movie. That’s what attracts me the most! It’s so cool to have a comment from New Zealand. Makes me feel like my blog has international appeal so thank you for reading. Fun Fact: Scarlett Johansson, who released an album Anywhere I Lay My Head back in 2008, was originally cast to play Keira Knightley’s part. I just saw this last night and I loved every bit of it 😀 Especially the music. Yeah the soundtrack has some nice moments. hmmm i’m not much of a fan of the premise, but i definitely plan to rent this. The premise seemed so basic to me – musical comedy-drama. I’m a fan of the premise. I’m also a fan of Sara Bareilles. And Adam Levine. I’m a fan of the fact that Sara and Adam are long-time college friends, who went into the music biz at around the same time, but he made it big before she did, so he took her on tour with Maroon 5 as his opening act… Haven’t seen the movie yet, but being such a rabid Sara Bareilles fan all these years, something tells me the plot will sound familiar… 😉 Thanks for the review! I saw Sara Bareilles open for British pop singer Mika back in 2007, even before she hit it big with Love Song. But just to be clear, Keira Knightley is the star/singer. I thought she sounded like someone who would be a fan of Sara Bareilles. I was looking forward to seeing BEGIN AGAIN, until I read some negative reviews. Now I’m starting to bounce back to hopeful after reading your review. Your love of movies involving good musical soundtracks and performances is apparent in your pieces, and it seems like this film hit all the right notes for you. It’s got an 81% Fresh rating on RT so the general consensus is quite positive so I think you’ll enjoy it.